3d floor plans are a great way to let prospective buyers get a sense of the layout and available space of the property. Picsera can create either a 2D or 3D floor plan from a hand sketch or set of blueprints. Want a discount? Become a member by purchasing purchasing VIP Membership, Studio Plan Subscription or Evan Joseph Subscription, or log in if you are a member. 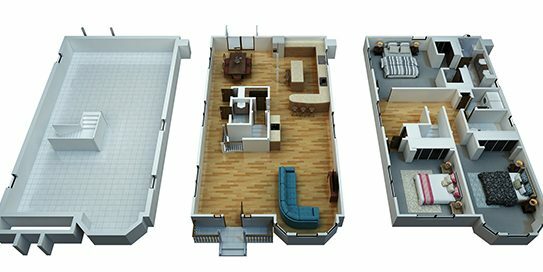 3D Floor plans are an ideal way to provide the prospective buyer a better sense of the available space and increase your chances of selling the property. However, creating floor plans can be time consuming and very difficult to create. We can help! Starting at just $29, we provide high quality 2d or 3d floor plans for real estate agents, property managers and developers. All we need from you is a rough drawing with the exact measurements of the room, or a blueprint and we’ll do the rest! This small investment can make all the difference in a sale. 3D floor plans work best when showing properties to prospective buyers that are not used to seeing floor plans. Alternatively, you can choose the 2D floor plans option which is more affordable is still effective. Think of us as your own real estate photo expert team without the hassle of project management. Just upload your images and we’ll do all the hard work for you! You’ll get professional photos or floor plans with fast turnaround, our satisfaction guaranteed promise, and professional US based support when you need it most.